A wealthy, proper society girl finds that she's much more popular with men when she pretends to be a "bad" girl. The story of the fictional American small town of Grover's Corners between 1901 and 1913 through the everyday lives of its citizens. During the 1860s Tucson, a pioneer woman struggles to succeed in the freight and cattle business while at risk at the hands of corrupt and violent local businessmen and rampaging Indians. A domineering woman marries a wealthy man for his money, and then uses her position to further her own ambitions for money and power. In early 19th Century France an ex-convict who failed to report to parole is relentlessly pursued over a 20 year period by an obsessive policeman. A lonely socialite masquerades as a maid and meets an unpretentious, plain-spoken cowboy who is unaware of her true identity. Mrs. Julia Hersey Gibbs: It seems to me, once in your life, before you die, you ought to see a country where they don't speak any English and they don't even want to. Art Thou Weary, Art Thou Languid? Q: What is 'Our Town' about? Q: Is 'Our Town' based on a book? "Our Town" was like a dramatized sermon about the fleeting nature of life and the need to appreciate every moment to the fullest. It depicted life in a small town, relying heavily on narration. 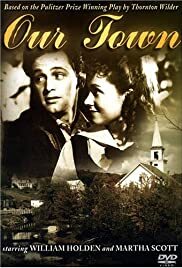 I was astonished, that such a flimsy (though charming) movie should boast a Thornton Wilder script and an Aaron Copland score. Despite its flimsiness, this movie is infinitely more lovable than similar movies, like "It's a Wonderful Life". It was blissfully devoid of drama, its mood was poetic, pleasing to the eye and ear, the dialogue fairly articulate and intelligent. The most poignant line was a girl saying to her mother: "Mom, am I pretty enough to Interest anyone?"